Of course, we made the assumption that whatever God would want us to do would be thrilling, exciting, fulfilling, and dramatic. We spent our first few months of marriage living in a tiny home, offered to us rent-free by a family friend. I left for work two days after we got back, and Lisa was stranded in a small community, out in the middle of nowhere, and she began to cry. “Well what’s the use of getting married if I see you less now than when we were engaged?” she complained. Fast-forward ten years. We had three small children, two of them in diapers, and even though we were in ministry, life still wasn’t “exciting.” We were barely making it financially, snuggled into a town house, and about to enter our Friday-night ritual—laundry and a rented movie. “What do you want to watch?” I asked Lisa as I gathered my keys and headed out the door. “Oh, how about a nice romantic comedy?” Lisa answered. I cringed. The last three videos we had watched together had been romantic comedies. If I had to watch another impossibly beautiful couple “meet cute” under extremely improbable circumstances, fall in love, get in a fight, and then spend sixty minutes falling back in love again, I thought I’d lose it. I took three steps out the door, then thought to myself, “When did, ‘Please, God, change the world through us’ suddenly become, ‘Should we watch Arnold Schwarzenegger or Julia Roberts?’ ” I didn’t remember any flashing neon signs that pointed in that direction, but somehow, somewhere, it had happened. I remembered the intensity of the night on which we had become engaged; the joyful getting to know each other on our honeymoon, filling out a preliminary application for a mission organization, bringing our first child home—but now, ten years later, we had “evolved” into spending Friday nights watching other people fall in love according to the machinations of a Hollywood script. That night I didn’t have any answers for the ordinariness of marriage, but taking an honest look at my situation definitely shook me awake. What was this thing called marriage? Was there no more purpose to it than this? This isn’t to suggest that happiness and holiness are contradictory. On the contrary, I believe we’ll live the happiest, most joy-filled lives when we walk in obedience. John Wesley taught that it is not possible for a man to be happy who is not also pursuing holiness. Think about it: who can be truly “happy” while filled with anger, rage, and malice? Who can be happy while nursing resentment or envy? Who can be honestly happy who is caught in the sticky compulsion of an insatiable lust or unceasing materialism? The glutton may enjoy his food, but he does not enjoy his condition. So I’m not anti-happiness; that would be silly. The problem I’m trying to address is that a “happy marriage” (defined romantically and in terms of ever-pleasant feelings) is too often the end game of most marriage books (even Christian marriage books). This is a false promise. You won’t find happiness at the end of a road named selfishness. 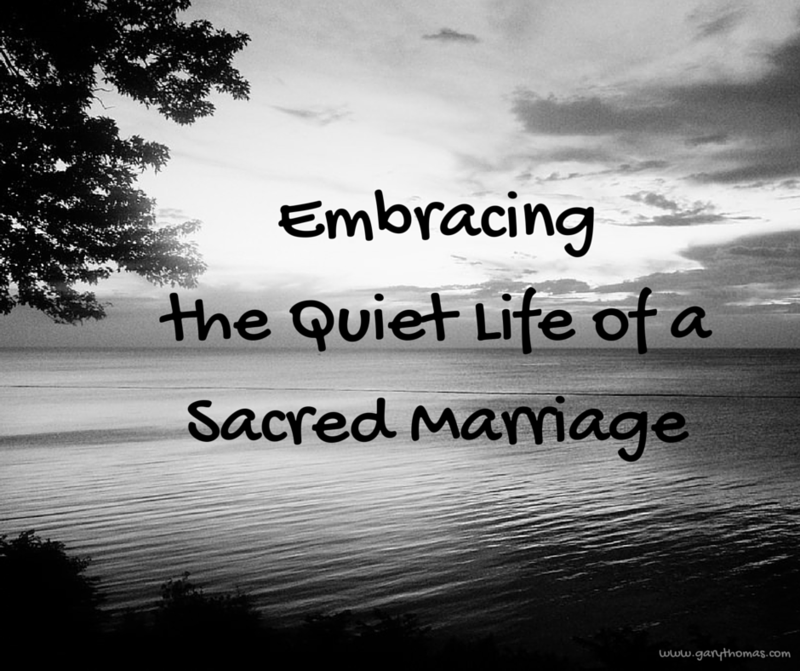 Sacred Marriage looks and points beyond marriage. Spiritual growth is the main theme; marriage is simply the context. Just as celibates use abstinence and religious hermits use isolation, so we can use marriage for the same purpose—to grow in our service, obedience, character, pursuit, and love of God. For centuries, Christian spirituality was virtually synonymous with “celibate spirituality,” that is, even married people thought we had to become like monks and nuns to grow in the Lord. We’d have to do the same spiritual exercises, best performed by single people (long periods of prayer that don’t allow for child rearing or marital discussion, seasons of fasting that make preparing meals for a family difficult, times of quiet meditation that seem impossible when kids of any age are in the house) rather than seeing how God could use our marriages to help us grow in character, in prayer, in worship, and service. Rather than develop a spirituality in which marriage serves our pursuit of holiness, the church focused on how closely married people could mimic “single spirituality” without neglecting their family. 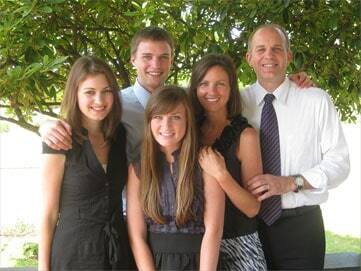 The family thus became an obstacle to overcome rather than a platform to spiritual growth. The reason the marriage relationship is often seen as a selfish one is because our motivations for marrying often are selfish. But it’s possible to reclaim marriage as one of the most selfless states a Christian can enter: a setting full of opportunities to foster spiritual growth and service to God. You’ve probably already realized that there was a purpose for your marriage that went beyond happiness. You might not have chosen the word “holiness” to express it, but you understood there was a transcendent truth beyond the superficial romance depicted in popular culture. Far from assaulting our happiness, pursuing the biblical holiness of a quiet and godly life in marriage enhances it by giving us a new appreciation for the person with whom we walk this journey. When you realize something is “sacred,” far from making it boring, it gives birth to a new awe, a new reverence, a take-your-breath away realization that something you’ve perhaps taken for granted is far more profound, far more powerful, far more life-giving and life-transforming than perhaps you’ve ever realized. I love marriage, and I love my marriage. I love the fun parts, the easy parts, the pleasurable parts, but also the difficult parts, the parts that frustrate me but help me understand myself and my spouse on a deeper level; the parts that are painful but that crucify the aspects of me that I hate; the parts that force me to my knees and teach me that I need to learn to love with God’s love instead of just trying harder. Marriage has led me to deeper levels of understanding, more pronounced worship, and a sense of fellowship that I never knew existed. What you want from your marriage has a huge impact on your satisfaction within marriage. If you want to grow in holiness, marriage is one of the best, most fulfilling places to be. Gary, i was asked to lead a Bible Study on marriage and I searched for one that was Biblical and had great wisdom. There are so many, but I started reading your ‘Sacred Marriage’ because of the title and was immediately taken by the wisdom in the first few sentences. My husband and I led the study , there were about 6 couples, most had been married 20 or more years. Every lesson was even more wisdom, we had never heard those life changing words before and all of us were blessed beyond measure ! Thank you and God bless you!!! Just watched your interview on LifeDestiny. Very interesting angle you are bringing in marriage. Where does one get this book in Cape Town, South Africa? I would like to buy it as a gift to my young married kids. Zondervan is a major US Publisher, a subsidiary of Harper Collins, so I think any international bookstore could order it. I know my books get into South Africa–I visited Cape Town over a decade ago, and many had already read some of my books. I love what you shared in your blog. for me Pursuing holiness in our marriage is the best teacher to make me look at my own actions and not that of my spouse. I am responsible to my Heavenly Father to walk in holiness. I cannot make my husband walk in holiness nor is it my job. It is God who works in each one of us and helps us to be transformed into His image. When I try, which I admit I have done far too often , to transform my husband I make a mess of our marriage. I need to constantly and continually remind myself of this fact – I need to let go and let God work. I need to be patient. Thank you for helping me to understand this truth. This is a common journey, isn’t it, Ruth? As a husband and a pastor, I appreciate your “down-to-earth” blog posts, especially the ones on marriage. As I’m reading them, I’m often saying “Been there, done that, still learning!” Your closing words struck home to me that I can truly enjoy even the difficult times in my marriage because there is a spiritual reality behind it that God wants me to learn from, use, and grow in.